The role of light in both science and art according to Ueno’s ‘The Light Theatre Opened to Universe (II)’ provides a continuity between both realms that provides important insights for light’s future roles in human life. 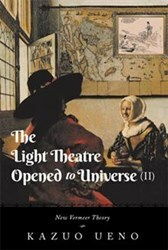 Every art historian nowadays except Ueno dismissed hidden influence to Vermeer from Christiaan Huygens, who is the most powerful Light physics and astronomy researcher in the 17th Century. Because unlike Leewenhoek’s close relation to Vermeer, it was neglected or underestimated until now, the event a father of Christiaan, Constantijn Huygens who is most influential musician and politician on that time, visited Vermeer’s atelier with his friends. People also dismissed the fact that Christiaan Huygens invented microtonal music theory. According to Ueno, Constantijn Huygens’ interest for Vermeer’s painting shows he is the most possible candidate for the person who stands intersection between painting, music and physics in the history of all subjects. Kazuo Ueno was born in 1952, in Tokyo. He is a journalist by profession who is especially interested in archaeology. He graduated from Nihon University with degrees in science and engineering; he also graduated with from the College of Literature and Science from the same university. He was a Tokyo Chofu City Archaeological Excavations Research Society assistant from 1980-83. His first article published in Jyuken no Nihonsi (Exam for Japanese History), Kofun (Ancient Tomb) Period, Seibun-sha Publisher, October 1985. His main published article is ‘Rekisi Dokuhon’ (History Magazine), Mawaki & Torihama Site, Shin-Jinbutu-Ourai Publisher, November 1985. Subsequently, he has had many other published articles such as ‘Rekisi to Tabi’ (History and Travel, Akita Book Store Publisher), ‘Rekisi Kaidou’ (History Road, PHP Institute), ‘AZ’ (Shin-Jinbutu-Ourai Publisher), ‘Rekisi Eye’ (History Eye, Nihon Bungei Sha). Ueno participated in the archaeological research excavation at Levroux, France (sponsored by Saint Germain en Laye Museum in Paris, France, 1981); in the archaeological research excavation at Metaponto, Italy (sponsored by Texas University, USA, 1983); the anthropological research excavation at Lazare, Nice, France (sponsored by Institut de Paléontologie Humaine, Paris, France, 1988). From 1989-1991, he wrote for Eikoku News Digest, Ohshu Journal (these are newspapers for Japanese people who live in England). He visited Iceland for filming of an NHK natural history satellite TV programme as London correspondent/coordinator in 1996. While staying in England, he took part in international exhibitions; he was also a fixture in several projects for local museums in Japan; and published many articles in the field of archaeology and natural history as a correspondent (1989-2005). He organized the World Dugout Canoe Collection for Wakasa Mikata Jomon Museum, Fukui Prefecture, a project motivated by new stone age dugout canoe finding in Japan; and the World Earring Collection for Shinto Village, Gunma Prefecture, motivated from over 600 new stone age earring findings in Japan. Apart from the preceding activity concerning archaeology, Ueno in the 80’s and 90’s was mainly based in Tokyo in the former period and London in the latter, and a busy freelance journalist specially interested in general science and fringe science (such as UFO). A lot of articles for Japanese science journals were published in this period. He has also worked for Japanese media (TV), appearing as Science Journalist and a TV program coordinator mainly in internationally linked fringe science subjects. His published books include: “Noh Stage for Jomon (New Stone Age) People” in Japan, 2004; “New Vermeer Theory: The Light Theatre Opened to Universe,” 2008; and “New Vermeer Theory: The Light Theatre Opened to Universe (II),” 2012 (this book, but a Japanese version). Members of the media who wish to review this book may request a complimentary paperback copy by contacting the publisher at 1-800-455-039. To purchase copies of the book for resale, please fax Xlibris at (02) 8088 6078 or call 1-800-455-039. Xlibris books can be purchased at Xlibris bookstore. For more information, contact Xlibris at 1-800-455-039 or on the web at http://www.Xlibris.com.au.